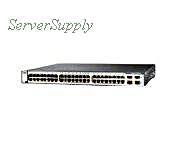 Cisco - WS-C3750-48PS-S CISCO - (WS-C3750-48PS-S) CISCO CATALYST 3750-48PS SMI - SWITCH 48PORTS WITH 4 X SFP (EMPTY) 1U RACK-MOUNTABLE. REFURBISHED. IN STOCK. SHIP SAME DAY.